You must make reservations at least 5 minutes in advance of the time at Bluefin Station 108. There is parking at the restaurant and additional parking in the lot adjacent to the restaurant. Bluefin Station is available for catering! Contact bluefinstationcatering@gmail.com for more information. 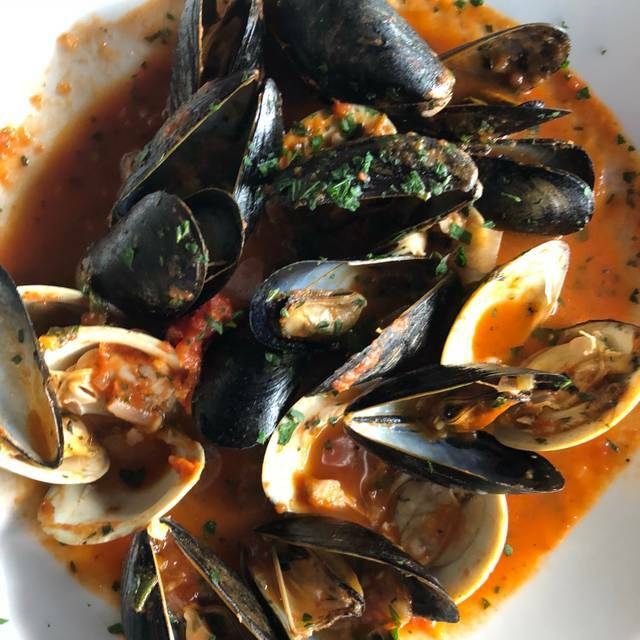 Bluefin Station 108 was inspired by the rich history of the Jersey shore barrier islands and a passion for food made from fresh ingredients, excellent service, and the company of friends. All set in a comfortable and casual atmosphere . This was our first time at Bluefin and we’ll definitely be back. The food was fresh and full of flavor and our waitress was fabulous. The decor is welcoming and warm. Thank you for the wonderful accolades! Please come again when we reopen in April! Another delicious meal. Very creative menu. Beautifully decorated but casual also. Thank you,Patti for the wonderful accolades! We appreciate your continued patronage and look forward to many return visits! The food was fabulous. I liked that it was BYOB. We had a great server named Dawn. Overall, a wonderful experience. Thank you for your great review! I will pass along your accolades to Dawn. She is a great server who takes pride in what she does and will appreciate the kind words. There was only 1 hostess/server and 1 busboy when we arrived with about 7 other tables. Felt bad for her. So understaffed for Restaurant Week Menu. Food was excellent. We appreciate your concern for Dawn on Thursday evening. Unfortunately our second server was a late arrival for his shift and under the short time frame we had difficulty finding coverage until he was able to get there. Dawn however did an excellent job and will appreciate your concern. We are always striving to learn from the issues that arise, and will be ensuring proper back up to eliminate staff shortages. Thank you for taking the time to write a review and we hope to see you again soon. Great restaurant! food was excellent! Services was excellent. Rice balls & grandma gravy was so so good. We're thrilled that you had such a great dinner and for taking the time to write a review! See you again soon! Great food. We really enjoyed everything on the prefix menu for restaurant week. 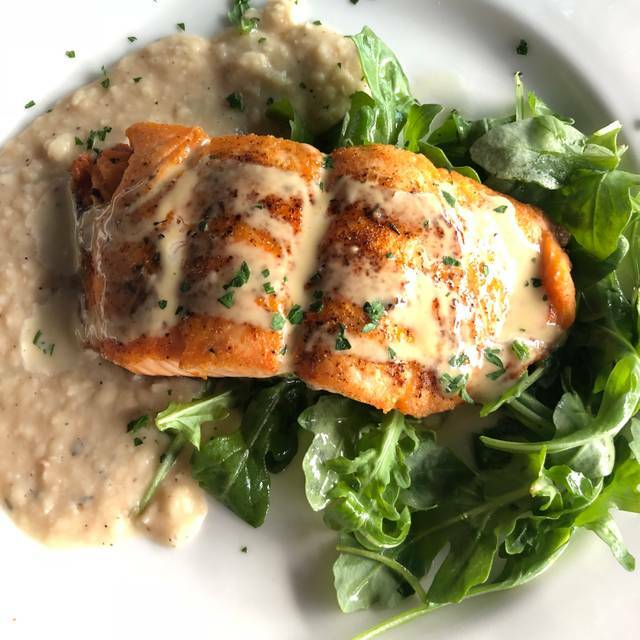 So glad you could join us for restaurant week! We are thrilled that you enjoyed the menu and hope to see you again soon! First time here. Service was excellent. Food was well presented and prepared. Cozy atmosphere. Will definitely be back! Thank you! We take great pride in the friendliness of our servers and providing great food to our customers! Hope to see you again soon! Thank you so much for your continued patronage! We are very fortunate to have a great team in the kitchen preparing amazing food! See you again soon! 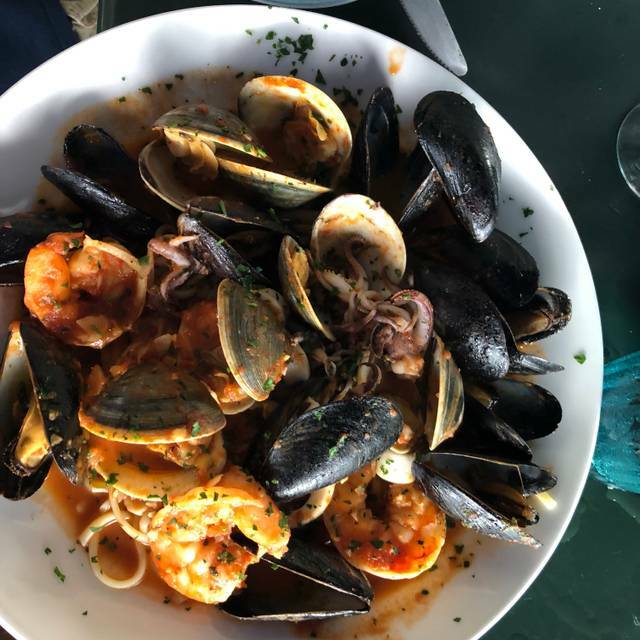 Thanks so much for giving us a try during Jersey Shore Restaurant Week! We're thrilled that you enjoyed your meal and hope to see you again soon! The service was exceptional. Our waitress very attentive and explained the menu in detail. The portions surprisingly large for restaurant week. The food was very well prepared and served hot. Definitely will return ! Thank you so much for your kind words! We will happily pass your message to the servers and the chefs, they will be pleased to hear such a great review. Looking forward to your return visit! Great food, friendly and attentive service, in a comfortable setting. Absolutely loved the 14-ounce pork chop in a maple and horseradish glaze; the wings; and the Sicilian (hot peppers) fried calamari. Thank you so much for taking the time to write a great review! Our chef takes great pride to cook all meals to order using only the finest ingredients! We look forward to your return visit! We have eaten at this restaurant several times, and it never disappoints. Food is creative and very good. Service is attentive and the restaurant overall is very comfortable. It does get loud, but that doesn't bother us. We would definitely reccomend giving it a try. Thank you Linda for taking the time to write a review and for patronage! We are thrilled that you enjoy our menu and our service. We appreciate your honest comments about the volume in the dining room. We are looking into and hope to be able to remedy the problem in the future. Looking forward to seeing you again soon! We all enjoyed what we ordered and would definitely go back. I'm so happy I gave Bluefin a second chance. The food was much better this time around. We had the meatballs, they came out piping hot. We also had the burger which was yummy. Then we had the tuna special which was amazing. My recommendation is to have the specials. The are creative and delicious. We appreciate that you gave us another try and that you took the time to write a review. As a new restaurant, we are consistently working to improve the customer experience from the food to the service. We are glad to have lived up to our expectations for your second visit! Please come again soon! The food is great. Even though it was the first night for our server; she did a thorough job. Unfortunately, our dinners came out just after we started our salads. We sent them back and a woman, I believe a manager, came over to apologize explaining it was a computer glitch. The server also apologized. Even after the dinners came back out, they were still good. The one downside is the noise level-too difficult to carry on a conversation. One reason could be the tin ceiling ; there is nothing to absorb sound. Thank you for the great review. Sincere apologies for the computer entry that caused your dinners to come out too soon. I am glad you enjoyed your meals when they were brought back to you. The noise level can become elevated when the dining room is full and we hope to be able to find a remedy in the future. We appreciate your honesty and feedback! Great to see a quality restaurant in the Lavallette area!! Thank you so much for taking the time to write a review! Our chef takes great pride to prepare all items on our menu fresh to order with the finest ingredients. We are excited that you had such a great experience and will share the accolades with the staff! Come again soon! We have been several times and the food is always delicious. Whether we eat inside or out, the service is always friendly and attentive. Good menu selection and the specials are a big hit with my family. So happy to have a new favorite place to eat! Pick another restaurant!!! I made reservations for my husband's 60th birthday which I mentioned when the reservations were made. We arrived 10 mins early and were seated immediately. That is the only thing good about this place. Service was beyond slow, we waited a minimum of 15 minutes for water, we never saw the bottle of wine we ordered, and it took over an hour for our food to arrive. Out of 4 plates, one dish was raw, one was over cooked, the third was so cold the ball of butter on it didn't melt a bit. Three of the 2 meals were not eaten at all the third barely touched . We again waited a very long time to speak to Management/The owner!!! after making a request to three different staff. Although apologetic she felt a 25% discount was sufficient when three of us returned our meals and did not get a replacement. When we again expressed how dissatisfied we were she became quite rude. My friends husband told her although 3 of us did not even eat ,we were leaving 100.00 but would never return again. She was shouting and threw the money at him. Honestly I don't know what she said because I was so upset I had headed to our car. This was supposed to be a birthday celebration not a sh*t show. I have never experienced anything like that before in my life!!! With respect, your recollection is inaccurate. I listened to the complaints, apologized, accepted responsibility & took 40% off the total bill. I returned to the table to address your dissatisfaction with the discount & was screamed at to the point of not being able to speak nor explain the adjustment. $100 was shoved in my hand as I was being threatened & I handed it back. The attempt was made to correct the problem & is unfortunately, even with forgiveness of the entire bill, not resolved. Waited close to a half hour to be seated at our table after having a reservation. Once seated we were completely ignored. No one came with water or to open our wine. We waited another 20 minutes and we left. We were very disappointed as we had heard great things about this restaurant. We are sorry that your experience was unacceptable on Sunday evening. We had an overlap of reservations due to a family that overstayed their time with us and seated your party as soon as he table was bussed and cleaned. While not an excuse for service that is not exemplary, we had 4 employees call out sick leaving us very understaffed. We hope that you choose Bluefin Station in the future so that we may provide you with the quality service you deserve. Food was good, service could have been a bit better. We never got bread until we asked for it, one person in our party ordered soup and never got it. Had mentioned it was a birthday on reservation, but no one asked or did anything about that. Overall, food was good enough that I would try it again. Waitress was nice, willing to give her the benefit of the doubt that she was just having a off night. I struggle to write this because I was so disheartened by the experience, I so enjoyed the food but the service was terrible. The food is excellent, the menu is well put together and exciting, and the specials are intricate and delicious but the service was absolutely horrific. The restaurant was empty when we came in, it took the waitress about 10 minutes to get to us even still so we ordered food and got appetizers quickly but waited an outrageous amount of time for our mains. Meanwhile the restaurant filled up and we watched as other tables were taken care of much more diligently and served their appetizers and entrees as we looked on. Our water glasses were not refilled and the waitress didn’t come to check on us once. The food runner also brought us the wrong dish at one point and wasn’t sure what he was delivering when he brought food over. When we complained I was met with disdain and attitude from the staff. If this place could get themselves together in regards to staff it would be a favorite spot of mine but until then I think I’ll be skipping it. We are sorry that your experience with us was lacking but appreciate the kind words about our food. Unfortunately the end of the summer season has brought staffing issues. Sunday night we had 4 employees call out sick leaving us very understaffed. This is of course no excuse for service that is not exemplary, however we thank you for your patience and understanding. We hope that you choose Bluefin Station in the future so that we may provide you with the quality service you deserve. Earliest reservation on Open Table was 8:15. We decided to go early anyway since we were already out. Got there 7:20, plenty of tables open. Staff was great and sat us right away. Overall service was very attentive, however no bread was served, as it was to other tables. Food was average. Had the special with shrimp and crab over pasta...two shrimp and very little crab. Dessert was amazing..the raspberry crème brulee was great. Thank you for your honesty and taking the time to write a review. We will be updating the outside for next season with new tables and hope that it spruces the patio up a bit! As a new restaurant with limited renovation funds, we chose to upgrade the inside the first year, and the outside in the second. However we did upgrade the bistro lighting. Please visit again and watch for future transformations! Thank you so much for taking time to write a review ! Come again soon! Great food, service and atmosphere! I would highly recommend this restaurant!!! My husband and I went this weekend and enjoyed ourselves. We order the Meatball duo -it was awesome. I had the 108 ahi tuna it was very good and my husband had the Chicken Saltimbocca, he enjoyed it as well. I hope we go again soon. This used to be the Labrador Lounge. It’s totally redone inside, but they kept the ceiling which I thought was a nice tribute. The service was good. I don’t want to put the service down in any way, but it was slow at first, but then moved right along. The food was pretty delicious. I had the shrimp ettouffe, ( I know I’m spelling that wrong, my apologies. ) My husband had a lobster & crab special over angel hair. I would recommend. Thank you so much for taking the time to write a review! Thank you for your honesty about the service. As the summer season winds down we are experiencing turn over with staff and training new employees. Please come again soon to experience the great service we aspire to provide all our guests! This was our 2nd visit to Blue Fin Station - the first time was during the opening week - which was not a winner. However we are so glad we gave it another shot! Food was great, service great - our waitress was adorable. I think it is only going to get better over time! Only thing I think that needs improvement is the bread basket either serve better bread or just don't serve any. We are so lucky to have this in Normandy! Thank you so much for giving us another try! As you can imagine, the first weeks of opening a restaurant can be trying to say the least. We have been and are continuously working to improve our kitchen and front of the house to provide the best customer experience possible! We appreciate your feedback regarding the bread and would welcome further discussion about the quality/ kind of bread you may like to see us serve. We receive our bread from Colandra's Bakery. Do you have other suggestions? We celebrated my mkm’s Birthday here . The staff couldn’t have been nicer and more helpful to helping scelenrate her!!! The food was outstanding! Everyone had an amazing time!!! Bluefin Station couldn't be more thrilled to have helped make the birthday girl's day special ! Best wishes for many more! Our 3rd visit. Still happy, but not has happy as visits 1 and 2. We though the outside patio was loud last time due to a big group sitting near us, but it was very loud again this time unfortunately. We will try indoors next time. The special we ordered was lacking flavor, but all other dishes were yummy! Thank you for trying us again! We're sorry it was loud on your visit. Our space is small so voices can carry. When you return, please discuss this with the hostess when making a reservation and we will try to seat you in a quieter area. See you again soon! Excellent! Menu is fresh, and inventive but also includes some Classically good meals. Fish was so yummy, my kids ate the Bounty meal down to the bottom of the plate. Definitely coming back! Just kind of average. Service was very slow. Portions were very generous. This was our first visit & everyone in our party was impressed. Everything was well prepared & very tasty. Service was excellent. We are foodies & I highly recommend a visit to Blue Fin Station. Love that they have vegetarian and vegan and gluten free options!!! This was our third time at Bluefin Station this summer, and our last. The first two visits we liked the food. The service seemed a little inexperienced, but that comes with new restaurants, I get it. But this time was a total disaster. 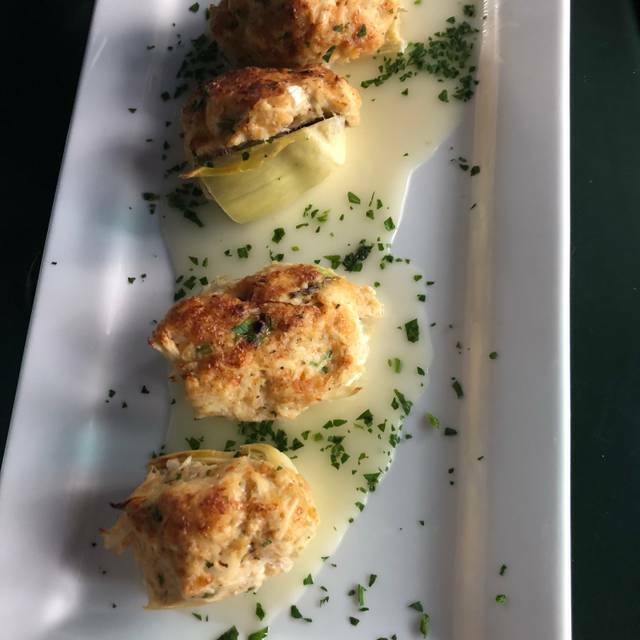 The lump crabmeat stuffed artichoke hearts were cold, the Shrimp Etouffee was soupy, and service was marginal. We got our bread long after our entrees arrived. Thank God we brought great wine! They have got to get it together or they’ll just be another mediocre restaurant at best. Birthday bummer for sure!